A chance to acquire a most charming two bedroom character cottage which is tucked away in a traffic free location just off the bottom of Chapel Street with lovely sea views over Penzance harbour to Mounts Bay and beyond. The property has been modernised to a high standard, retaining many period features, making an ideal retreat, holiday home or investment purchase. Dock Cottage is a lovely example of a period home in a sought after area of Penzance, being within close walking distance of the promenade and most local amenities. Due to the popularity of properties such as this, we would recommend an early appointment to avoid disappointment. KITCHEN/DINER 11' 10" x 9' 10" (3.61m x 3m) Inset stainless steel sink with cupboards below, fitted wall and base units, solid wood worksurfaces, integrated dishwasher, free standing washing machine and fridge freezer, built in oven and four ring hob, beamed ceiling, understairs storage cupboard, double glazed window, radiator. 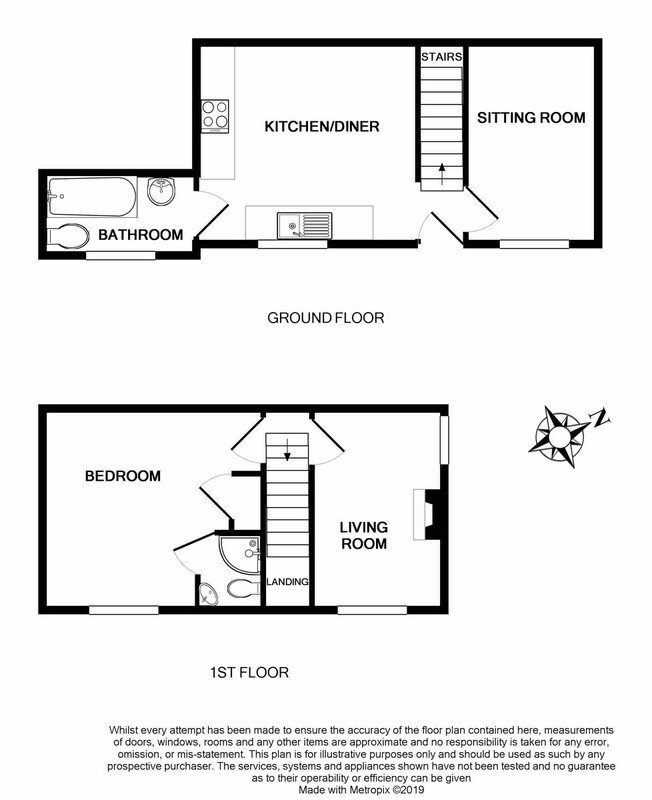 BEDROOM 1 11' 6" x 7' 6" (3.51m x 2.29m) Built in wardrobes and cupboards, beamed ceiling, double glazed window, radiator. BATHROOM Coloured suite comprising panelled bath with mixer tap and shower attachment, pedestal wash hand basin, low level WC, wall mounted gas boiler, heated towel rail. LIVING ROOM 11' 5" x 8' 2" (3.48m x 2.49m) Double aspect room with lovely sea over sea views over Penzance harbour and beyond, window seat, cast iron burner, television point, radiator. EN SUITE SHOWER ROOM White suite comprising semi-circular shower cubicle with glazed door, wash hand basin, low level WC, double glazed Velux window, heated towel rail. OUTSIDE Shared pedestrian access leads to a small look out room with stable door, ideal for small sitting area with views across Penzance harbour. Storage shed. SERVICES Mains water, electricity, gas and drainage. DIRECTIONS From the centre of Penzance, proceed down Chapel Street passing The Turk's Head and Admiral Benbow public houses on your left hand side. When you come to the church on the right hand side, just past this you will come to a gate on your left hand side. Proceed through the wrought iron gate and the door beyond whereby the cottage is down on your left hand side.